it’s Eva Thorne. She flies in on her broomstick in the Season 3 premiere just in time to see an anti-missile test of the Viper vs. Martha go wrong. Eva is known as “The Fixer” — a corporate maven and master manipulator. She’s got the power (from the Department of Defense), and she attempts to use it. Her stated goal? To make Global Dynamics pay for itself. The only person Eva seems to have regard for is Stark, but even he isn’t falling for it…yet. Allison, however, seems to be falling for him…again. This entry was posted in Eureka, Fandoms, Humor, Other, Reviews, Sci-Fi, TV, Uncategorized and tagged Drone, Eureka, Eva Thorne, Jack Carter, Martha, Nathan Stark on July 30, 2008 by Shiny1. Do You Want ‘Possums with That? Having just returned from two weeks in splendid [self imposed] isolation, I’m tempted to declare that I was on a spiritual retreat, or writing the next Great American Novel. This entry was posted in Eureka, FanaticSpace.com, Fandoms, Humor, Other, Personal, Reviews, Sci-Fi, TV and tagged Eureka, Fan, Guest Post, Matt Frewer, Max Headroom, Sci-Fi, Taggart on March 5, 2008 by Shiny1. Moist Von Lipwig makes money the old fashioned way, he prints it. Actually, printing money is a new idea in Ankh-Morpork. Moist is going to have a tough time convincing people that paper is worth it’s weight in gold. Especially when he has his Bank Director licking his face and the Assassins’s Guild looking over his shoulder. He’s already been hanged as a criminal once. What’s the worst that could happen? It seems like everyone is out to get him, even those that want him to succeed. 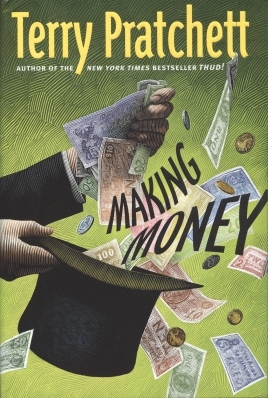 Making Money continues the story of Moist Von Lipwig, formerly known as Arthur Spangler con man extraordinaire, introduced in Terry Pratchett’s book Going Postal . As the story opens Moist has the Post Office running like, well, a Post Office. Things are running as smoothly as they can for any public service. That’s a bit too smooth for Moist. After living his life by relying on his wits any normal job, even one as respectable as Post Master, is just a bit too normal. Oh there are ways of keeping a hand in, like picking the occasional lock, but it’s just not enough. Even Extreme Sneezing doesn’t provide the edge of your seat, and possibly your life, thrill of his old career. The gods must have taken pity on him because he’s about to have all the thrills he can handle. Through some very odd occurrences Moist becomes acting Director of the Royal Bank of Ankh-Morpork. It seems like everyone is out to get him, even those that want him to succeed. It’s going to take every con man’s trick he knows, and he may have to invent a few as he goes along, just to stay alive. If you enjoy the Discworld books, be sure to pick this one up. I don’t know if it’s Terry Pratchett at his best, but it’s darn close. The hoops that Moist has to jump through in this book would make any stunt man cringe. This entry was posted in Books, Fandoms, Humor on October 18, 2007 by 2xKnight.